Part of a juvenile dinosaur unearthed in Utah may upend what experts know about the evolutionary history of ceratopsids — the group of frilled, horn-faced dinosaurs that include Triceratops and Styracosaurus. The nearly 100 million-year-old fossil may be evidence of the oldest ceratopsid ever found, pre-dating the previous record-holder — the little Zuniceratops, from New Mexico — by nearly 10 million years. But how all of these species fit together remains a puzzle. And the newly found specimen from Utah might prove to be a key piece, said Dr. Kenneth Carpenter. “It provides strong supportive evidence for evolutionarily more advanced ceratopsians in North America 98 million years ago, give or take a million or two,” said Carpenter, a paleontologist at Utah State University Eastern Prehistoric Museum. But the Utah specimen suggests that the much bigger and more developed ceratopsids came on the scene far earlier than had been suspected — perhaps only 10 million years after the tiny Aquilops thrived. Unlike more recent ceratopsid finds, this specimen was originally excavated in 1991, in the Cedar Mountain formation of east-central Utah. But until recently, it was stashed away in storage at the Oklahoma Museum of Natural History. The specimen consists solely of an ilium, or pelvic bone, found in a stratum of Earth dated to around 100 million years ago, at the very beginning of the Cenomanian age. Some 26 centimeters, or 10 inches, long, the bone was originally thought to have belonged to Eolambia, a Iguanodon-like plant-eater whose remains are abundant in the area where it was found. But Carpenter and Cifelli soon noticed some important anatomical clues. For one thing, they found that the bone came from a juvenile dinosaur, as shown by the fibers and striations that run through its outer layers. “The fibrous bone texture indicates the Cedar Mountain ceratopsoid was not fully grown,” Carpenter said. What’s more, its shape and orientation differ significantly from the pelvis of Eolambia. To find out what animal the bone truly came from, Carpenter compared it to the ilia of several ceratopsids, including an older, ancestral protoceratops from Idaho; a flashy Agujaceratops from Texas; a juvenile dinosaur from Montana known as Brachyceratops, and finally some specimens from China. 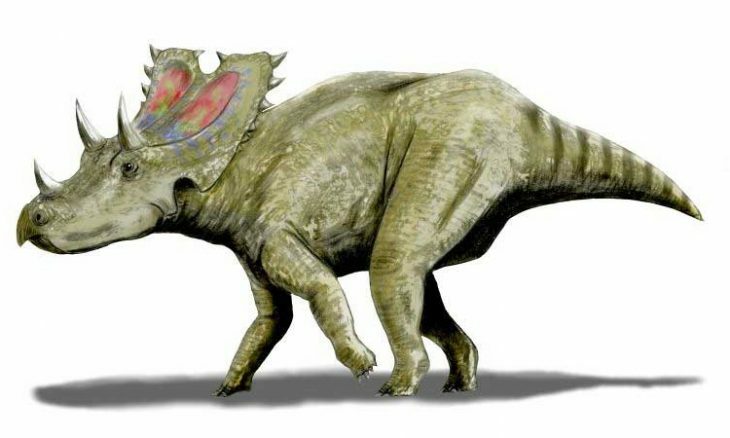 The analysis showed that the Utah fossil most closely resembled that of the young ceratopsid from Texas, Carpenter reported. “The ilium shares features with the only good juvenile ilium of an advanced ceratopsian, Agujaceratops,” he said. Noted for its long brow horns and heart-shaped, spiky frill, Agujaceratops is well-documented, thanks to bone beds in Texas that contained many of the animals of various ages, from babies to adults. This has allowed for a detailed analysis of how the dinosaurs changed through their life cycle, including their pelvic bones. “This juvenile Agujaceratops is different from the adult in that the front part, called the preacetabular process, curves towards the side and down. In the adult, this part is more horizontal. The Utah and Texas fossils share this feature, Carpenter noted, even though the Texas ceratopsids lived about 18 million years after the Cedar Mountain dinosaur. The ancient ilium unearthed in Utah is “definitely not” that of Agujaceratops itself, he added. or another. 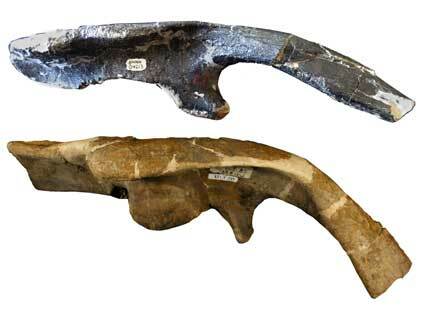 “Agujaceratops juveniles simply retain the primitive ceratospid pattern in the ilium,” he said. 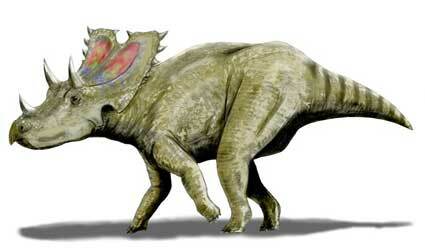 But what ceratopsid the bone actually belongs to is, and will probably remain, unknown. Nonetheless, Carpenter and Cifelli say, their discovery shows that there’s more to the story of ceratopsian evolution than experts currently realize. I have a fossil tooth that I can’t seem to find in any book would love to get into contact with someone who would love to research it.